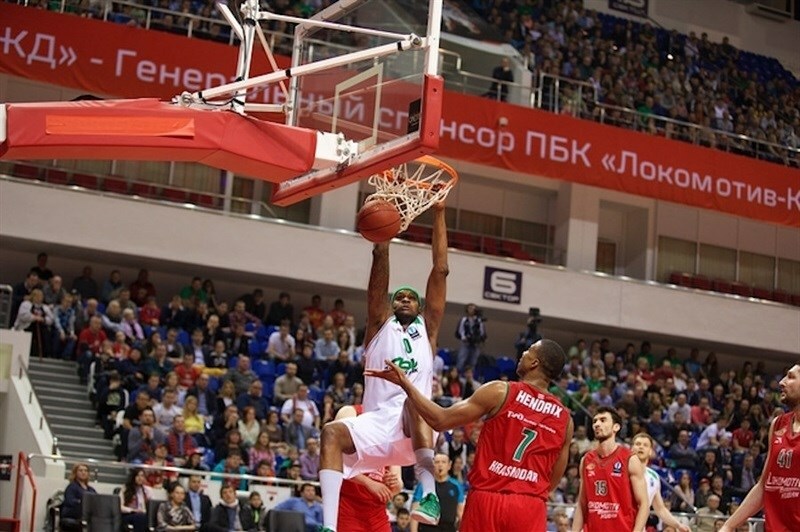 2014 Eurocup runner-up Unics Kazan dominated the second half to beat Lokomotiv Kuban Krasnodar 58-79 and advance to the Eurocup Semifinals for the fourth time. 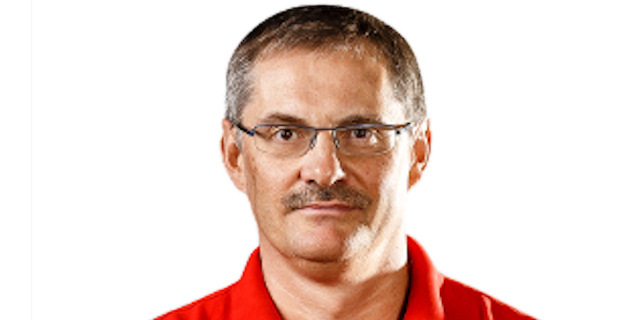 Lokomotiv, which rode a competition-record 20-game winning streak into Game 2 of the two-game total-points quarterfinals series, won Game 1 by 9 points. The hosts seemed in control through the first half, but James White scored 7 points during a 3-19 charge that bridged the third and fourth quarters to make it 44-61 and gave Unics an 8-point series lead. White added a triple for a 20-point difference and the visitors held strong until the final buzzer. 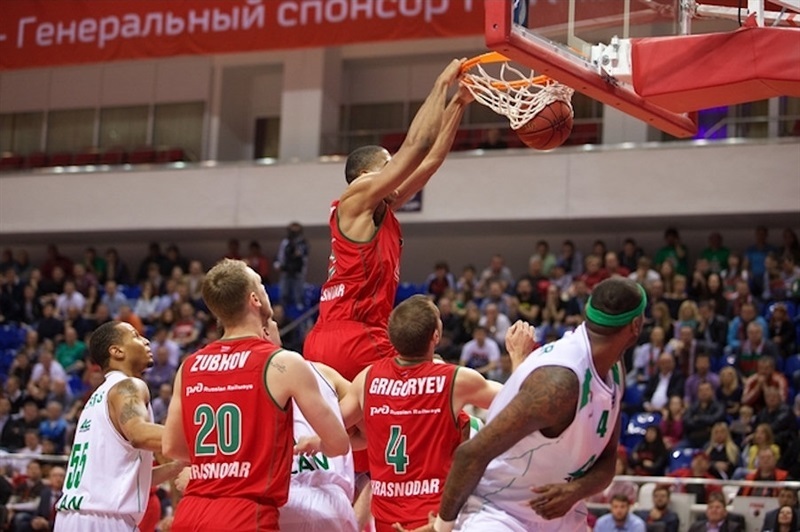 Unics outscored Lokomotiv 25-45 in the second half. Short-handed Lokomotiv was without stars Derrick Brown and Antony Randolph and only dressed 10 players, while Unics missed leading scorer Keith Langford through injury. White finished with 19 points and 8 rebounds, while D’Or Fischer posted 17 and 8 and Kostas Kaimakoglou scored 11 for Unics, which held Lokomotiv to a season-low offensive output. 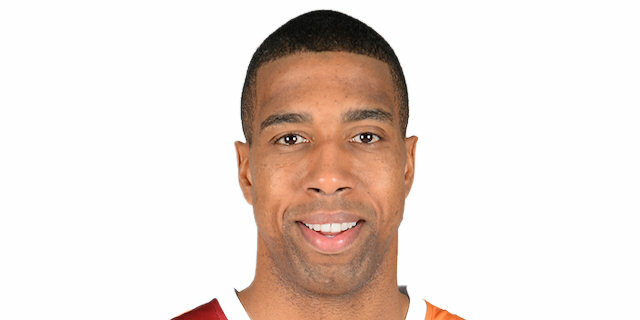 Malcolm Delaney led Lokomotiv with 16 points, Andrey Zubkov added 12 and Krunoslav Simon 10. 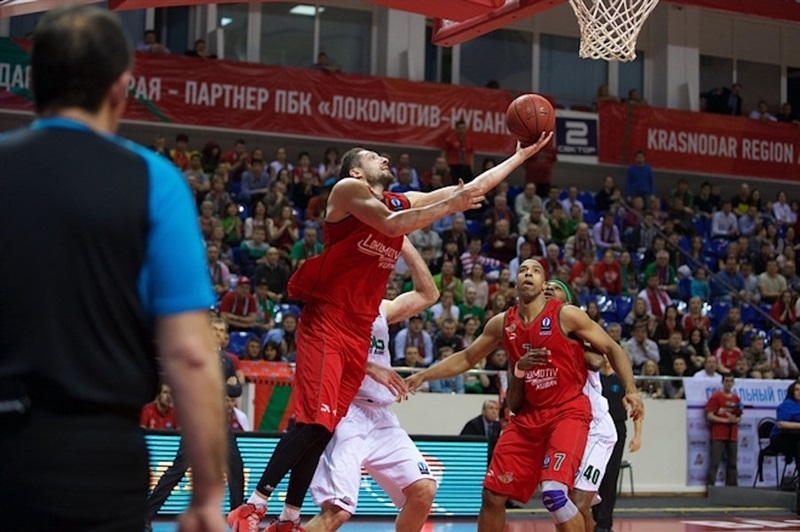 Lokomotiv got off to a promising start with baskets by Nikita Kurbanov and Eugeny Voronov. More than three minutes passed before Fischer split free throws for Unics’s first point. 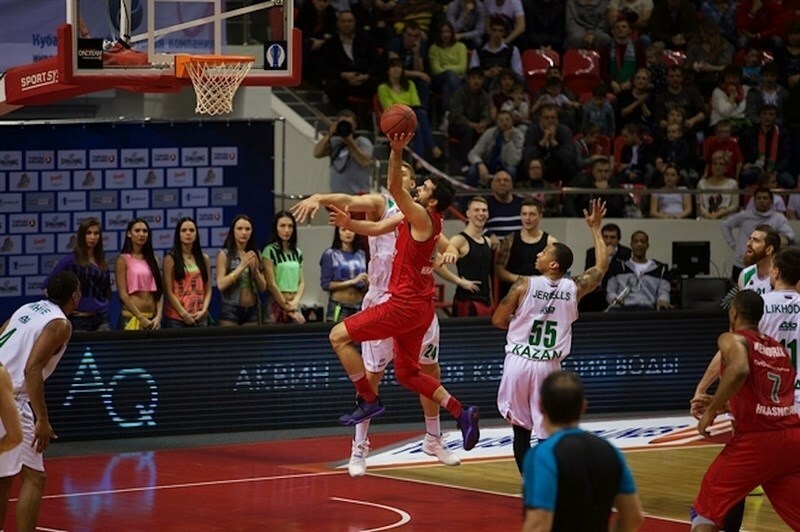 Kaimakoglou connected on the game's first three-pointer to bring the visitors within 2, but Maxim Grigoryev matched him. Kaimakoglou and White carried Unics to 15-14, however Simon’s last-second jumper ended the first quarter at 17-14. White sliced through the Lokomotiv defense for a slam and his team’s first lead of the game at 17-18. The teams traded scores for several minutes until Simon’s three-point play put the hosts up 26-22. A Delaney triple extended the difference to 5 in the game and 14 in the series. White took charge with a steal, layup and free throw followed by a jumper in the paint to put Unics up 31-32. 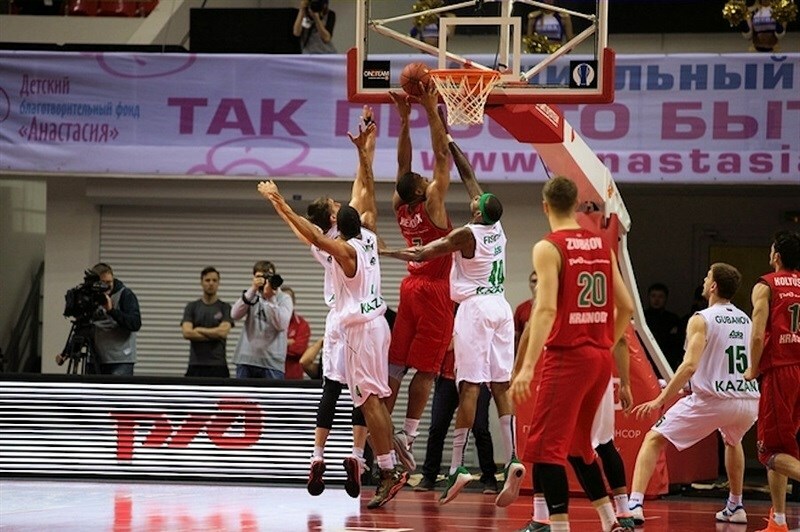 After jumpers by Delaney and White, the halftime score was 33-34, which meant Lokomotiv led 120-112. Fischer sandwiched a pair of baskets around a triple from Zubkov to start the second half. White pushed his team ahead 36-40 and to within 5 points on aggregate before Zubkov buried a second triple. Sergey Bykov made it 39-42 midway through the third quarter. A Valeriy Likhodey jumper gave Unica a 6-point edge in the game and brought it within 3 in the series. After Simon split free throws, White and Kaimakoglu made it 42-51 and tied the series at 129-129. Simon sank 2 free throws to restore a series lead, but Curtis Jerrells made a high-arcing three in the closing seconds of the quarter to make it 44-54 – and give Unics its first lead in the series of the night. White banked in a one-handed shot and rejected Delaney before Kaimakoglou added a mid-range jumper to make it 44-58. White capped a 3-19 Unics charge with a triple for a 17-point lead in the game and 8 in the series. Richard Hendrix’s tip in did not change much; White’s second three and a pair of free throws made it 48-68. 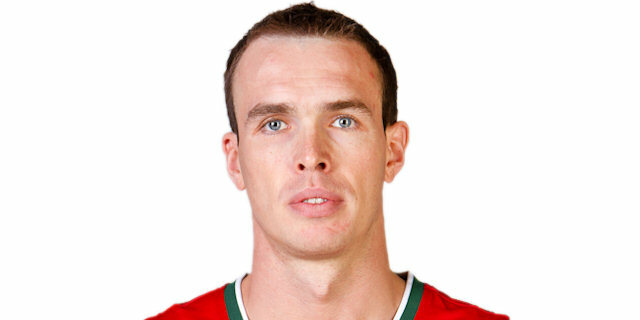 Delaney hit from downtown and soon Alexey Zhukanenko did the same to give Lokomotiv hope. 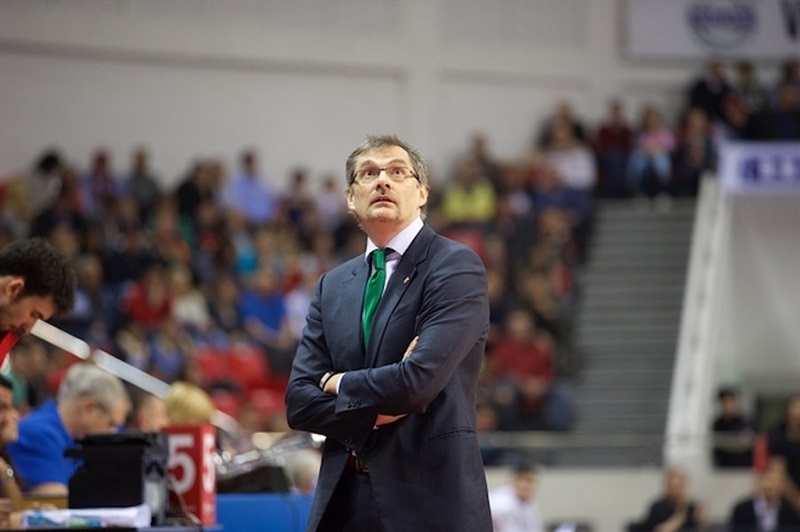 However Unics looked to kill the clock on its possessions and every Unics basket or Lokomotiv mistake became magnified. A Fischer jumper made it 55-72 with two minutes remaining. A three-point play by Fischer with 28 seconds to go iced the win and allowed Unics to celebrate. "It's hard to analyze this game at the moment. I feel sorry for our fans, who deserved for us to go further in our Eurocup season, and I believe that our team deserved it as well. But we're in a situation where one game decides it all. Many things were not working for us and we suffered from the absences of key players. We just didn't have enough weapons when our leaders on the court were not delivering." Congratulations to our club, our team and our fans. We showed real heart today. What we did today deserves respect; holding Loko to just 58 points is a huge victory. We neutralized their main scorers and were fighting on the boards as a team. We had an up and down season, but managed to find the right balance at the right time. The individual match ups of Delaney against Bykov, Simon against White, Hendrix and Fisher were key today. We're going further and we believe in ourselves, that's most important. "Tough loss for us, but we need to regroup, focus on the VTB League, get our injured guys back and prove we can do many great things this season." "We went out today with hope in our heart ;you can't do without hope in sports. The 9-point deficit was a burden, but coach told us that we should continue what we did in the last minutes of the previous game, when we cut the deficit a little. Today we won with defense, each one of us treated his defensive assignment seriously; I wanted to shut down Delaney, our guys were focused on Simon. We didn't allow Lokomotiv to run; that's what they do great at home. We just did what we do best; we stayed focused on defense every single second."